The agreement between President Obama and congressional Republicans to extend tax cuts and unemployment benefits is getting strong bipartisan support. Overall, 60% approve of the agreement while just 22% disapprove. There are virtually no partisan differences in opinions about the agreement — 63% of Democrats approve of it, as do 62% of Republicans and 60% of independents. 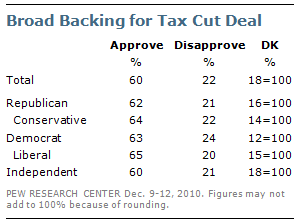 Among Democrats, liberals are as supportive of the agreement as are conservative and moderate Democrats. The latest national survey by the Pew Research Center for the People & the Press, conducted Dec. 9-12 among 1,011 adults, finds that on balance more say the agreement will help rather than hurt the U.S. economy and people like themselves. Nearly half (48%) say the agreement will help the economy, while just 29% think it will hurt the economy. Opinions are similar about the personal impact of the deal: Nearly twice as many say the agreement will help (47%) rather than hurt (25%) people like themselves. However, far more people say the agreement on tax cuts and unemployment benefits will hurt (46%), rather than help (26%) the federal budget deficit. Opinions about the impact of the agreement — like views of the deal itself — show little difference across parties. Roughly half of Republicans, Democrats and independents say the agreement will both be good for the economy and for people like themselves. 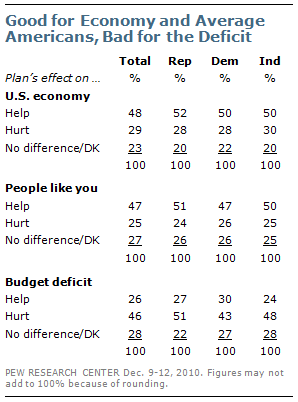 Pluralities across all three groups see the agreement will be bad for the federal budget deficit; Republicans (51%) are slightly more likely than Democrats (43%) to say that the agreement will have a negative impact on the deficit.